1725 was quite a busy year, both culturally and politically. In Britain, one noteworthy event was George I’s foundation of the Order of the Bath. However, the hanging of the notorious thief-taker Jonathan Wild at Tyburn on 24 May 1725 probably attracted greater interest. In Europe, there were several events of undoubted political significance. Tsar Peter the Great died on 8 February and was succeeded by his second wife – Catherine I was the first woman to rule Russia. The Emperor Charles VI and King Philip V of Spain signed the Treaty of Vienna on 30 April, which included a guarantee of the Pragmatic Sanction allowing the Emperor to be succeeded by a daughter, despite the prevailing Salic law. In France, the fifteen year old Louis XV married the Polish Princess Marie Leszczyńska. She was seven years older than the King. At the Paris Opéra, Les Eléments an opéra-ballet by Delalande and Destouches was given its first public performance on 29 May 1725. The work had initially been performed in 1721 as a court ballet, with Louis XV among the dancers. Its popularity on the public stage was to be long-lived. In London there were two notably diverse premieres within a week. Handel’s latest opera Rodelinda was performed at the King’s Theatre on 13 February. On 20 February, Drury Lane’s new pantomime Apollo and Daphne opened. It was described in the bills as a ‘Dramatick Entertainment of Dancing’ and it did indeed have a great deal of serious dancing in its main plot. 1725 was an unusually busy year for dance publishing. In London, L’Abbé’s new dance for the year was Prince Frederick, in honour of George I’s eldest grandson. L’Abbé’s A New Collection of Dances, notations for 13 choreographies performed in London’s theatres, may have appeared this year (it has no publication date). The undated 18th edition of The Dancing-Master has also been assigned to 1725, although some modern sources prefer 1728. 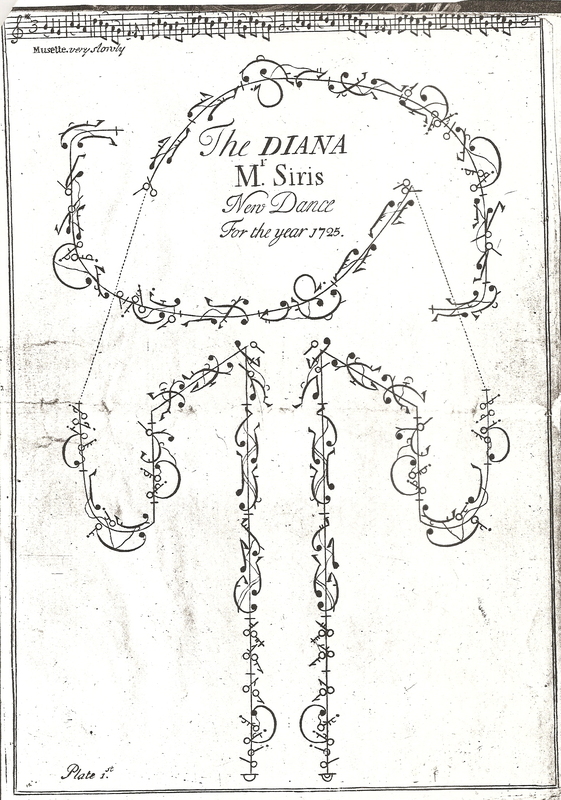 The dancing master Siris published his own ‘dance for the year’ The Diana, in honour of the Duchess of Marlborough’s much-loved grand-daughter Lady Diana Spencer. In Paris, the most important dance publication of 1725 was undoubtedly Pierre Rameau’s treatise Le Maître a danser. This work explains how to perform the steps recorded by Feuillet a quarter of a century earlier. Rameau’s revision of the Beauchamp-Feuillet system of notation, put forward in his Abbrégé de la Nouvelle Méthode, probably appeared in late 1725. He followed Feuillet by including a collection of twelve dances by Pecour as part two of the treatise, all in his revised notation. These dances, described as the most beautiful and best liked of Pecour’s many choreographies, were apparently still popular in the ballroom. They were given a new lease of life by their appearance in subsequent reissues of Rameau’s Abbrégé. The regular annual collections of dances issued first by Feuillet and then by Dezais continued with the XXIII Recüeil de dances pour l’Année 1725. Dezais also published his Premier Livre de Contre-Dances, which I have written about in other posts. The title Premier Livre … suggests that he was intending to pursue a new series devoted to notations of contredanses. No more collections of either danses à deux or contredanses appeared after 1725. The abrupt cessation suggests that Dezais died before he could prepare or publish further collections. 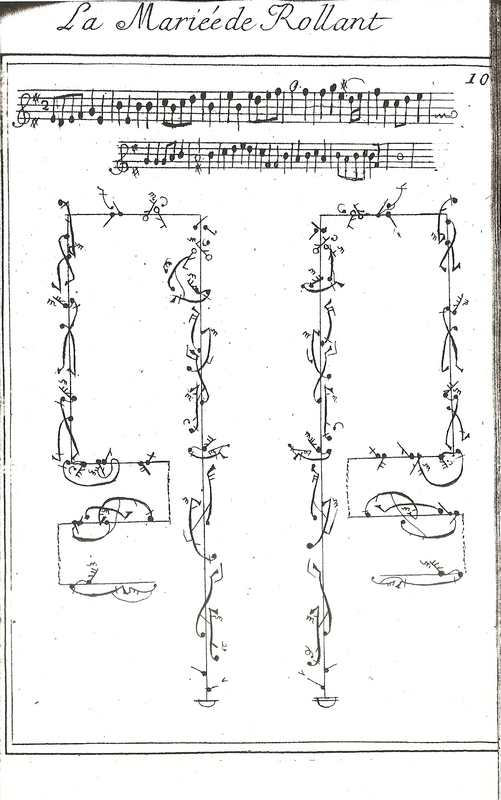 1725 marks the end of the publication of notated dances in France, until the contredanses known as cotillons began to appear in a simplified form of notation in the early 1760s. This entry was posted in Ballroom Dancing, Dance Treatises & Notations, Dancing at Court, Stage Dancing and tagged Anthony L’Abbé, Baroque Dance, Jacques Dezais, Pierre Rameau on August 25, 2015 by moiragoff.